Trump must investigate the FBI, Russia, and voter suppression. 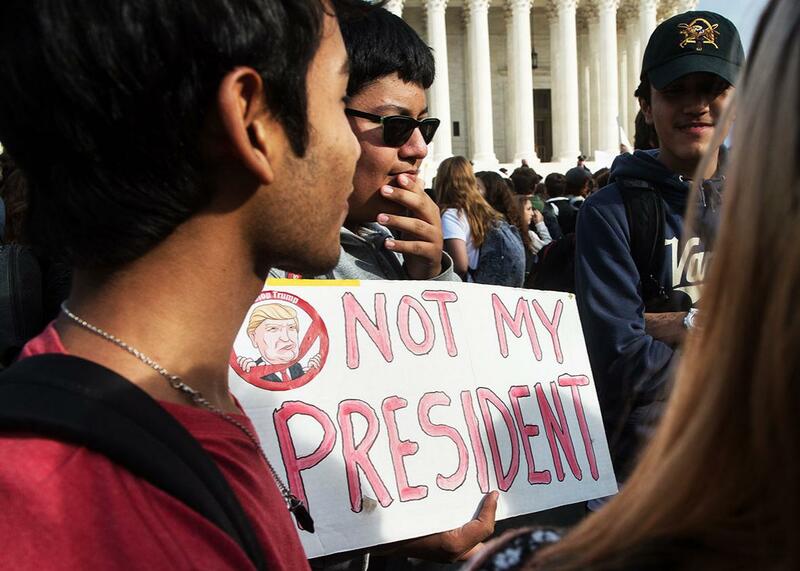 Secondary school students gather in front of the Supreme Court in Washington, D.C., on Tuesday as they protest the election of President-elect Donald Trump. Many Donald Trump supporters have said that it is time to come together, to put the divisive campaign behind us, and to unite on common ground. What would lead the losing side to take such calls seriously? President-elect Trump giving a speech against hate crimes and repudiating the Muslim ban he floated during his campaign, yes. But here are four more suggestions for Donald Trump. I offer them without illusion that they are likely to be adopted. They would be sensible steps, however, for a new president who actually did want to bring the country together. 1. President-elect Trump should propose an independent bipartisan commission to investigate FBI interference in the 2016 election. It appears that rogue elements within the FBI used the extraordinary powers of federal law enforcement to attempt to influence the presidential election. Damaging leaks came from the Bureau, seemingly timed to inflict maximum political damage. For example, FBI Director James Comey referred in his first letter to Congress only to an “unrelated investigation.” It was presumably an anti–Hillary Clinton group within the FBI that unlawfully leaked the link to an investigation of Anthony Weiner’s alleged sexting with a 15-year-old girl. The selective leaking by an element of FBI to influence an election is a crime against democracy. We cannot “move on” without addressing it. 2. President-elect Trump should propose an independent bipartisan commission to investigate interference by Russian secret intelligence in the 2016 election. There is no doubt that Russian civilian and military intelligence invaded and unlawfully appropriated internal documents from the Democratic National Committee. And there is little doubt, as politically damaging information was selectively released, that this operation was done to influence the U.S. presidential election. How could investigating this not be a matter of the highest national priority? The debates in Philadelphia in 1787 reflected the framers’ enormous concern that U.S. politics would become playthings of European governments. They feared French and British parties would be a staple of American politics. In our time we may need fear having Russian- and Chinese-influenced parties. Ordinarily, our political losers should simply accept their losses in this election and look ahead to the election four years from now. But why would we expect the next election to be fair, as long as the FBI and KGB interference in this election goes unexamined and unresolved? If FBI elements can undertake such actions in a Democratic administration with a Democratic attorney general, why would we not expect them to engage in similar or worse actions to re-elect a sitting President Trump? And if Russia can meddle in our election even as a Democratic administration can threaten retaliation, what will stop them from re-doubling their efforts to re-elect Trump? 3. President-elect Trump should propose an independent bipartisan commission to investigate voter suppression in the 2016 election. I offer this suggestion without opinion as to whether unjustified barriers to voting played a significant role in the election. But we ought to know. What would a study of this election show about whether there was any voter fraud avoided? What would it show about whether the newly enacted restrictions made voting unfairly more burdensome? When the Supreme Court invalidated a key provision of the Voting Rights Act, it expressly assumed that racial discrimination was behind us and that political actors could be trusted to see that unjustified barriers would not be tolerated. We need to make good on that expectation. I should pause here to say: Independent commissions are not the only mechanism for addressing these three problems. House and Senate committees could undertake these inquiries themselves, of course. There was a time when we could expect the legislature to be a check on executive malfeasance. But the era of hyperpartisanship has undercut the role of Congress as a check, as increasingly members see themselves as party members first and officers of a separate branch of government a distant second. Sen. Lindsey Graham is a welcome exception, calling on Tuesday for his fellow Republicans to investigate Putin’s seeming interference in the American election. The press could and should also undertake these inquiries, but the media lacks the critical power to compel documents and testimony. And of course where leaks are the weapons of partisan warfare, the press is conflicted. The New York Times was a recipient of leaked information from “three law enforcement officials,” which I would presume likely included someone from the FBI group that was attempting to influence the election. The Washington Post featured gossip and worse from Russian interference attributing the information to what it called the “anti-secrecy organization WikiLeaks”—an oddly benign description of one of the most secretive and least transparent organizations around, one that now appears to be a conduit for Russian military intelligence. So bipartisan commissions may be our best hope. And President Trump could make them happen. 4. President-elect Trump should urge the Senate to vote on Merrick Garland. I hesitate to include this fourth suggestion since it is hard for political realists to imagine that it would be adopted. But consider how appropriate it would be. President-elect Trump—whose rise in politics was based in some measure upon his birtherism denial of Obama’s legitimacy—could atone for that by asking the Senate to treat Obama’s nomination of Judge Garland as the act of a legitimate president. The vacancy arose with nearly a year left in President Obama’s term. In a step unprecedented in all of American history, the Senate majority refuses even to provide a hearing. On Sunday, the president-elect’s adviser Kellyanne Conway said, “It’s time really for President Obama and Secretary Clinton to say to these protesters, ‘This man is our president.’ ” How deep is the irony in those words? The man who is our president is Barack Obama. How can those on the losing side take seriously calls to avoid obstructing the next president while the president we have now is still actively being obstructed? I’m not sanguine about the chances that these proposals will come to pass. But they would be taken serious by anyone who wanted to make a credible argument that we should put the election behind us and support the legitimacy of an elected president.